Aim: The aim of this study was to evaluate the association between the tooth loss impaired chewing ability and cognitive impairment among the elderly of western Maharashtra, India. Materials and Methods: It was a cross-sectional, community-based study conducted among 200 consenting elderly. Information regarding tooth loss, chewing ability and cognitive impairment (clock-drawing test), and sociodemographic variables were obtained and analyzed. Results: Participants with impaired chewing ability had 5.57 more odds of cognitive impairment. Similarly, those with multiple tooth loss had 2.4 times odds of cognitive impairment compared to normal counterparts. Conclusions: Multiple tooth loss and impaired chewing ability increase the odds of cognitive impairment. Countries across the world are at the brink of demographic transition with the ever-increasing proportion of elderly. The United Nations Population Division (United Nations, 2011) estimated that by the year 2050, the share of 60+ populations will rise to 19% in India as against 8% in the year 2010. Cognitive impairment is a sign of early dementia. It causes sustained and increasing loss of memory, affects daily activities, and affects the social life and mental faculties such as rational thinking and planning among others. Risk factors for dementia are genetics, medical conditions such as diabetes or hypertension, stroke, diet, stress, and habits such as smoking and alcohol consumption. The developing countries will have to bear the burden of increasing cases of dementia due to increased lifespan and presence of medical conditions such as stroke in the future. Such a community-based study delving into the relationship of tooth loss and impaired chewing ability and dementia has not been conducted in India. Hence, this study was conducted to assess the relationship between the tooth loss, chewing ability, and dementia among the elderly population of western Maharashtra, India. Ethical approval was obtained from the Institutional Ethics Committee before the commencement of the study (KIMSDU/IEC/04/2016). Written informed consent was obtained from the participants of the study. This study was conducted among the elderly population of Satara district, western part of Maharashtra in the Indian subcontinent. Rural population predominates this region (81%). This prospective study was conducted from January 2017 to May 2017 (5 months) in the Satara district of western Maharashtra. Elderly of age 60 years and above were invited to participate in the study. The elderly who consented to participate in the study were included as the study sample. The exclusion criteria were the presence of mental retardation or disorientation based on the medical or those with sensory defects which impeded the examination. Information on variables such as age, gender, medical history, living conditions, and education was recorded in a structured interview. Information on the independence in activities of daily living (Katz Index) and chewing ability were obtained on further questioning. The index for recording the independence in activities of daily living consisted of six activities such as bathing, dressing, toileting, transferring, continence, and feeding. The responses were scored as “1” if independence in the activity was noted and as “0” if dependence in the activity was noted. The score of 1 or above was considered as dependence on daily activities. The chewing ability was assessed using the index with sixteen items assessing the ability to chew variety of foods such as boiled vegetables to raw foods. Items commonly consumed in India such as jowar/bajra bhakri, chapati, rice, and parathas were also included in the item list. If the participants reported difficulty in chewing any of the foods score “1” was given for the same. On the contrary, no difficulty in chewing any type of foods was given a score of “0.” The difficulty in chewing either of the foods was considered as impaired chewing efficiency. Dementia was assessed using a simple clock-drawing test. The participants were asked to fill out numbers in pre-drawn clock of 10.6 cm diameter and were asked to depict a particular timing. The clock drawings were evaluated based on the method of Watson et al. The scores ranged from 0 to 7. The scores between 0 and 3 depicted a normal range of score and those between 4 and 7 depicted abnormal (demented) range of score. The presence or absence of cognitive impairment was the main outcome variable. Mean and standard deviations were calculated for the variables. Chi-square and t-test were used for bivariate analysis to compare the study variables with the outcome variable. The variable significantly associated with the outcome variable was entered into multivariate analysis. All the data were analyzed using SPSS version 20.0 (IBM, USA). P < 0.05 was considered statistically significant. The total sample consisted of 210 participants, of which ten participants were excluded due to incomplete questionnaire/clock-drawing test or both. The final sample analyzed was 200 (114 males and 86 females). [Table 1]a and [Table 1]b shows the characteristics of the study participants in which it was observed that there was a statistically significant relation between the variables of chewing ability (P < 0.02), loss of teeth/dental status (P < 0.001), and functional dependency (P < 0.003) with cognitive impairment. On regression analysis, it was found that participants with impaired chewing ability had 5.57 more odds of cognitive impairment. 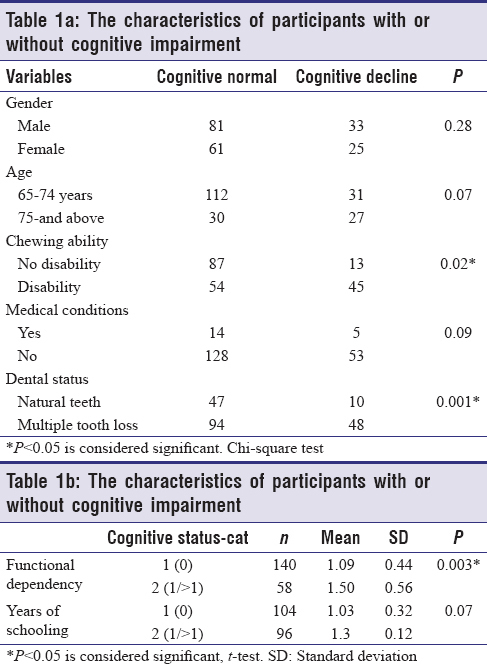 Similarly, those with multiple tooth loss had 2.4 times odds of cognitive impairment compared to normal counterparts [Table 2]. This was a cross-sectional study to assess the association between the cognitive status and loss of teeth and chewing ability among the elderly of western Maharashtra of Indian subcontinent. We found a significant association between these variables after controlling for the sociodemographic and medical conditions. We used clock-drawing test to assess the cognitive status of the participants for the first time in this study area. Various dementia scales are available in the literature, and the best among them all is the mini–mental scale. In our sample, this scale could not be used due to language incompatibility and because the Hindi translation of this scale has not been proved to share similar characteristics like the original English version of the scale. Hence, the clock-drawing test was used due to its advantages of minimal training, quick and acceptable for dementia screening, fairly good sensitivity, and specificity. Studies have suggested the causal role of tooth loss in the cognitive decline among elderly. The absence of full complement of natural teeth is said to affect the daily intake of nutrients and vitamins which might affect the cognitive status., Other mechanism is the presence of proinflammatory factors due to chronic periodontal infection that might affect the brain by exacerbating the inflammatory processes and vascular pathologies. In our study, a causal inference could not be derived due to the cross-sectional nature of the research. Chewing ability has been the focus of studies assessing the cognitive status of individuals. We found increased odds of cognitive decline among the participants who reported chewing disability. These findings are supported by studies conducted by Lexomboon et al. and Takata et al. It has been postulated in the literature that such an association can be due to increase in cerebral blood flow or stimulation of hippocampus-dependent cognitive function. As mentioned earlier, the causal mechanism could not be derived from this study. Factors such as age, gender, and medical conditions such as diabetes and hypertension did not affect the relation between the tooth loss, chewing ability, and cognitive decline. This study is the first of its kinds in this region. We have attempted to overcome the drawback of the inability of using mini–mental scale and instead used clock-drawing test due to its more diagrammatic representation and because it is easy to use and follow. Drawbacks of the study can be the cross-sectional nature of the research due to which causal inference could not be derived. Lack of databases for geriatric populations which make it impossible to derive longitudinal data is a definite limitation here. We measured tooth loss using trained examiners, so the bias due to self-reporting could be avoided. In the future studies with larger sample size using longitudinal study design would be valuable for the population under study. In this study, we found that our participants with multiple tooth loss and chewing inability had higher odds of cognitive decline compared to the normal counterparts. We are grateful for the support and cooperation and useful insights of my colleagues during the editing of the manuscript. We are grateful for the kind cooperation of the study participants. Population reference bureau. Today Res Aging 2012;25:1-6. Available from: https://www.prb.org/todays-research-on-aging/. [Last accessed on 2017 Oct 12]. Petersen RC. Mild cognitive impairment as a diagnostic entity. J Intern Med 2004;256:183-94. Qiu C, De Ronchi D, Fratiglioni L. The epidemiology of the dementias: An update. Curr Opin Psychiatry 2007;20:380-5. Das SK, Pal S, Ghosal MK. Dementia: Indian scenario. Neurol India 2012;60:618-24. Miquel S, Aspiras M, Day JEL. Does reduced mastication influence cognitive and systemic health during aging? Physiol Behav 2018;188:239-50. Stein PS, Desrosiers M, Donegan SJ, Yepes JF, Kryscio RJ. Tooth loss, dementia and neuropathology in the nun study. J Am Dent Assoc 2007;138:1314-22. Kaye EK, Valencia A, Baba N, Spiro A 3rd, Dietrich T, Garcia RI, et al. Tooth loss and periodontal disease predict poor cognitive function in older men. J Am Geriatr Soc 2010;58:713-8. Okamoto N, Morikawa M, Okamoto K, Habu N, Iwamoto J, Tomioka K, et al. Relationship of tooth loss to mild memory impairment and cognitive impairment: Findings from the Fujiwara-kyo study. Behav Brain Funct 2010;6:77. Available from: http://www.census2011.co.in/census/district/365-satara.html. [Last accessed on 2017 Dec 24]. Azad A, Mohammadinezhad T, Taghizadeh G, Lajevardi L. Clinical assessment of activities of daily living in acute stroke: Validation of the Persian version of Katz index. Med J Islam Repub Iran 2017;31:30. Palsetia D, Rao GP, Tiwari SC, Lodha P, De Sousa A. The clock drawing test versus mini-mental status examination as a screening tool for dementia: A Clinical comparison. Indian J Psychol Med 2018;40:1-0. Sheehan B. Assessment scales in dementia. Ther Adv Neurol Disord 2012;5:349-58. Tiwari SC, Tripathi RK, Kumar A. Applicability of the mini-mental state examination (MMSE) and the Hindi mental state examination (HMSE) to the urban elderly in India: A pilot study. Int Psychogeriatr 2009;21:123-8. Lexomboon D, Trulsson M, Wårdh I, Parker MG. Chewing ability and tooth loss: Association with cognitive impairment in an elderly population study. J Am Geriatr Soc 2012;60:1951-6. Li J, Xu H, Pan W, Wu B. Association between tooth loss and cognitive decline: A 13-year longitudinal study of Chinese older adults. PLoS One 2017;12:e0171404. Krall E, Hayes C, Garcia R. How dentition status and masticatory function affect nutrient intake. J Am Dent Assoc 1998;129:1261-9. Tucker KL, Qiao N, Scott T, Rosenberg I, Spiro A 3rd. High homocysteine and low B vitamins predict cognitive decline in aging men: The veterans affairs normative aging study. Am J Clin Nutr 2005;82:627-35. Tonsekar PP, Jiang SS, Yue G. Periodontal disease, tooth loss and dementia: Is there a link? A systematic review. Gerodontology 2017;34:151-63. Takata Y, Ansai T, Soh I, Akifusa S, Sonoki K, Fujisawa K, et al. Relationship between chewing ability and high-level functional capacity in an 80-year-old population in japan. Gerodontology 2008;25:147-54. Miyamoto I, Yoshida K, Tsuboi Y, Iizuka T. Rehabilitation with dental prosthesis can increase cerebral regional blood volume. Clin Oral Implants Res 2005;16:723-7. Azuma K, Zhou Q, Niwa M, Kubo KY. Association between mastication, the hippocampus, and the HPA axis: A Comprehensive review. Int J Mol Sci 2017;18: pii: E1687.